Raccoon nesting season peaks during spring months, with most babies being born in March. During this time, mothers will seek shelter in warm, dry areas to make the first few months of their children’s lives as comfortable as possible. Although raccoon babies are incredibly cute when they are young, they still pose safety risks. Raccoon mothers are known to be extremely protective, making them even more dangerous during this time. Because of this, you will need to take some extra precautions during the spring to ensure your property doesn’t become their first home. Raccoons are extremely intelligent animals that will find all kinds of different ways to enter a space they desire. Unlike other pests, raccoons actually enjoy the water, making fish bonds and swimming pools a favourite for them. Generally speaking, during nesting season raccoons will seek out warm, cozy areas to minimize their time spent outdoors. Sometimes they are so determined to do this that they will actually remove shingles or siding in an attempt to enjoy the inside of your home. Keeping this in mind, there are some measures you can take to prevent this happening in the first place. These critters are notorious for eating everything and anything—making your trash bin the perfect source for their feast. Because they are so creative, keeping them out of your garbage bin is a challenge. Consider strapping down the lid with a bungee cord or only putting out your waste the morning it’s collecting. In doing so, you give raccoons less of an incentive to stick around and check what else your home has to offer after they’ve chowed down. 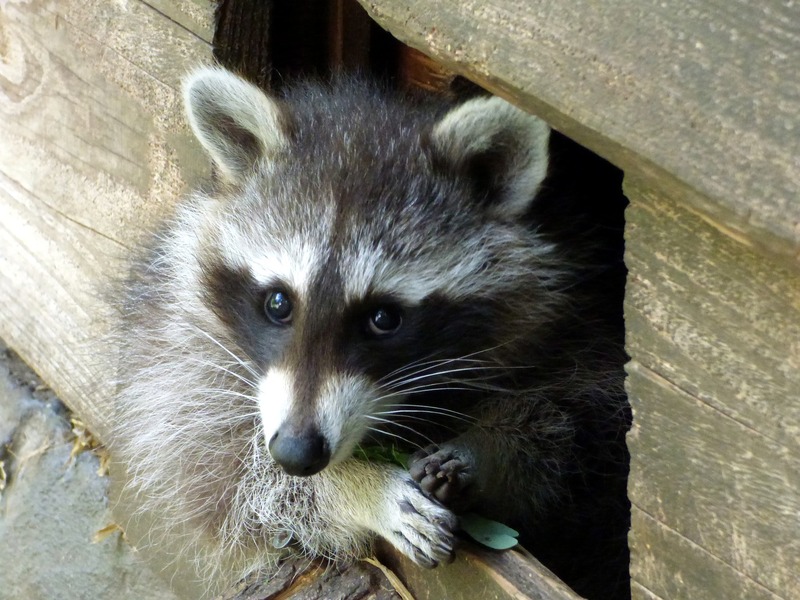 Raccoons—similar to other pests—thrive in unsanitary environments. By keeping your yard and home extra clean, you won’t be their first choice when they’re scoping out a new residence. If you have fruit trees, be sure to pick up the contents daily. After a celebratory BBQ, clean up food remains and smells quickly after to prevent attracting unwanted guests. Keep your plants maintained to avoid overgrowth that gives raccoons the perfect place to hide. To prevent nests forming inside your home, you will need to first take a look at the outside. Similar to cats, raccoons are able to squeeze into extremely small spaces. This stresses the importance of checking the exterior of your home for any gaps or holes that they could easily fit through. Raccoons are good climbers, so make sure you are also look up above to not miss any gaps. You may also want to consider removing your pet door. Although it gives you the convenience of not having to let your pet out every few minutes, they also give raccoons an easy way to enter. In the event that raccoons have entered your home, it’s important to not handle the issues yourself. Raccoons are carriers of dangerous diseases and are known to defend themselves if they feel cornered. They are particularly protective when they have young, making spring the time to stay alert. A professional raccoon removal service will use protective and measures and humane methods that prevent raccoons from nesting in your space again. Protect your home and family by getting a professional to assess your wildlife situation today. To learn more about our wildlife removal services and our approach, call 1-844-482-7243 today!